Ceilometers are simple but robust lidar systems. Normally laser pulses are generated of one wavelength. Their backscattered energy from the atmosphere is temporarily resolved. Originally, ceilometers are used for the detection of the cloud base height but they can also serve for determination of aerosol properties. 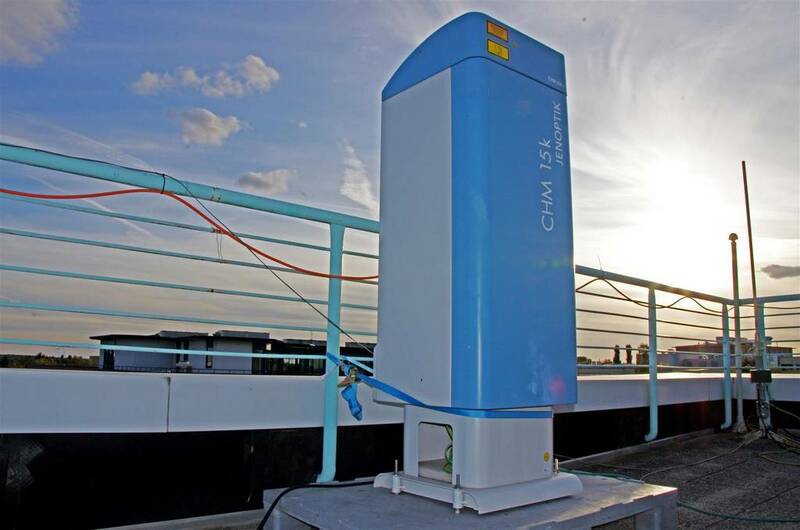 Beside PollyXT, the ceilometer is a central part of LACROS and Cloudnet to receive continuous information about the height of cloud and aerosol layers. On one hand this information is used for aerosol studies, on the other hand it id needed for the investigation of aerosol-cloud interaction. Figure 1 shows a ceilometer of the type CHM-15k of Jenoptik company as it is operated at TROPOS. Fig. 1: Ceilometer of type CHM-15k as it is operated at TROPOS. In the framework of Cloudnet, to provide a continous determination of the vertical cloud distribution and of microphysical cloud properties. In the framework of combined lidar-sun-photometer techniques to retrieve vertical profiles of the aerosol backscatter coefficient during daytime. To estimate boundary-layer and mixing-layer heights to aid the interpretation of ground-based in-situ aerosol measurements. During field experiments of ACTOS to assist planning of flights.